So 2009 has started with a boom and now the festive period already seems like a distant memory of some girl I kissed behind a tree at school camp in 1987…… Pleasant enough, but strangely unfulfilling. I hope you all had a good one. I’d always had a problem with Robert Redford’s 1980 picture ORDINARY PEOPLE. Even before I set eyes on a frame of this film I was against it, if the movie came up in conversation I’d sneer and sometimes throw crockery. There was only one reason for this and I have to admit, with hindsight, it was a pretty stupid….. It’s the movie that beat RAGING BULL to the best picture Oscar. Now winning an Oscar isn’t the be all, and end all of course, there are better accolades to receive, but it annoyed the hell out of me nonetheless. Being so in awe of anything can be dangerous but I genuinely believed that Martin Scorsese had been hung from a tree, publicly flayed and massaged with salt as RAGING BULL, for me, was a perfect example of what Oscar winning cinema should be. This visceral examination of man’s capability to self destruct had such an effect on me that when I found out it had been pipped by a family drama, instant unresearched opinions were formed. These opinions have been changed somewhat now I’ve actually seen the thing. Actually, the initial exposure to the picture came via the script. Our library at college has a collection of screenplays and this is one of them. I realised my half baked pre-conception was in trouble within the first ten pages and by the time I got to the end, the desire to see this film was overwhelming. In fact I read the last half of the picture in my local pub, at the bar, on a heaving Saturday night. it was incredible. Sitting reading the third act affected me physically, there was a welling up situation happening and there was nothing I could do about it. That’s the test of a good screenplay, if you can be COMPLETELY absorbed in the story whilst surrounded by drunk men in Edinburgh, you’ve got a hit…. Producers take note. The premise is simple, a family wracked with grief following the death of their son Buck in a boating accident struggle to function as a unit leaving each individual member lost in their own way. Timothy Hutton plays Conrad the surviving son who has returned to the family home after some time in a psychiatric hospital following the incident. Mary Tyler Moore plays Beth, the mother who uses her upper middle class social cycle as a barrier between herself and the truth, and Donald Sutherland who plays Calvin, a father desperately trying to keep his family intact whilst living with the same grief. It’s really powerful and moving stuff. The supporting performances are also very strong, notably Judd Hirsch (most famous for his role as in the 70’s comedy TAXI) playing Dr. Berger, Conrad’s Psychiatrist, who has maybe the most important part in this film. I really enjoyed the scenes with Berger and Conrad, they were beautifully shot and although we go back to that office on maybe 3 or 4 occasions, Redford does well to create a different aesthetic feel each time. These scenes also serve as a perfect respite from the claustrophobic atmosphere within the family house. Yes, there’s tension in that office but you can see that Conrad is making progress when in the company of Berger. Conrad’s relationship with his mother is the core conflict of the movie. Beth is submerged in the comforting folds of the well heeled social scene while her son tears himself apart with guilt fuelled by teenage alienation and the pressure of “performing” to the levels are are expected of him. Donald Sutherland is wonderfully understated in his role as the diplomatic father, trying to find a common ground between his wife and her son. In fact all the performances in this film are understated, it’s what makes the scenario so utterly believable. The structure of the film is interesting in that climactic confrontations are not held until the end of the picture, for a film of such seemingly sombre pace there’s many peaks and troughs. If I was to highlight one negative of this movie, and there are a few but I don’t want to go on too much about them, I’d say that the dream sequences seemed a bit clunky although absolutely essential. So seek out this film, anyone who’s had any kind of trouble with the complexities of family existence will completely buy into this picture. Oh,….. And it won the Oscar in 1980. That’s gotta be worth something right? There isn’t a lot I can say about this picture that hasn’t already been said. It’d been in my collection for a while so, as part of operation “plug in”, it got a play and I couldn’t have been more impressed. 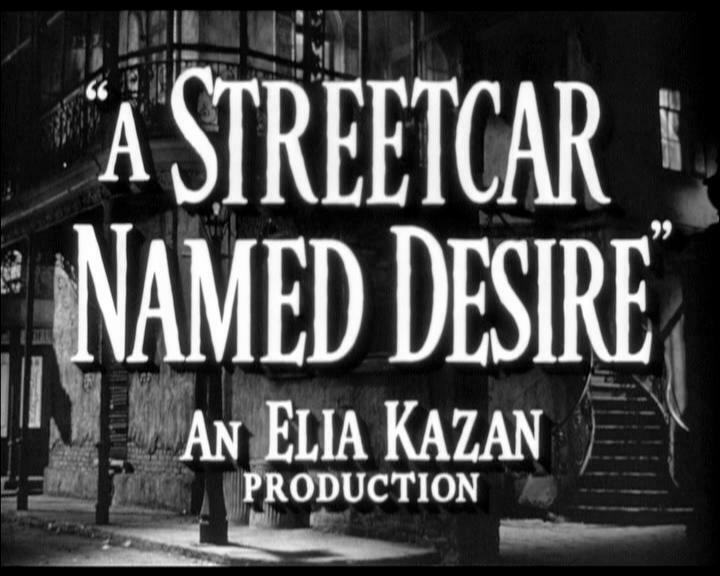 A STREETCAR NAMED DESIRE (1951) directed by Elia Kazan (One of my favourite directors) is one of those pictures where cast, director and story come together in perfect harmony to create something so natural and powerful, it completely takes your breath away. 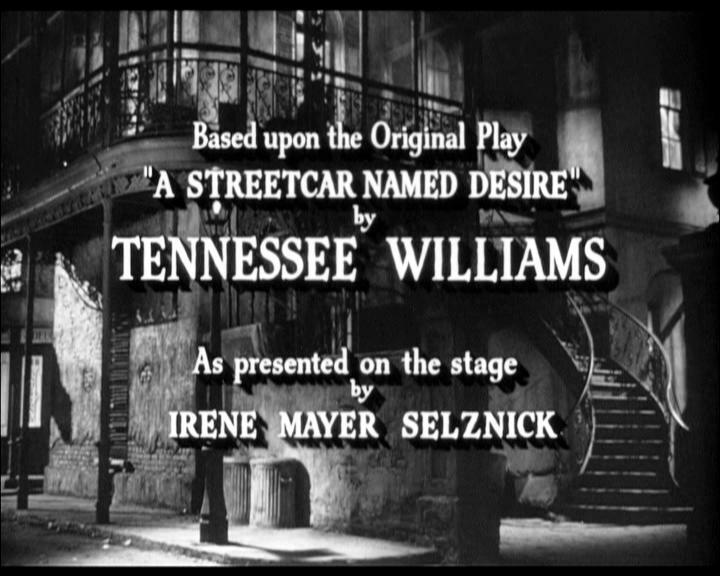 Adapted from the Tennassee Williams play of the same name, Streetcar had been a hit on both Broadway and in London before it’s eventual adaptation for the screen, which Williams himself assisted with. 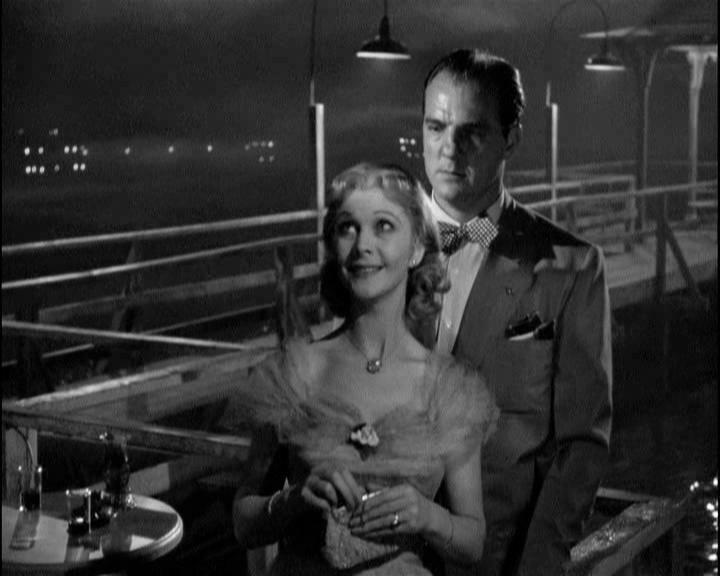 In both respective productions the stars of the film had also played the same role on stage, Marlon Brando playing Stanley Kowalski in New York while Vivien Leigh played Blanche DuBois in the West End. The picture follows the story of Banche DuBois, a southern belle and self proclaimed lady of higher standing who comes to stay with her sister Stella due to their family house being lost, the reasons for which Blanche is extremely vague about. Stanley becomes increasingly suspicious of Blanch and as he attempts to reveal who she really is, Blanche herself slips into a mental descent she’ll never return from. These lead performances, are by no means the only examples of incredible acting in this picture. 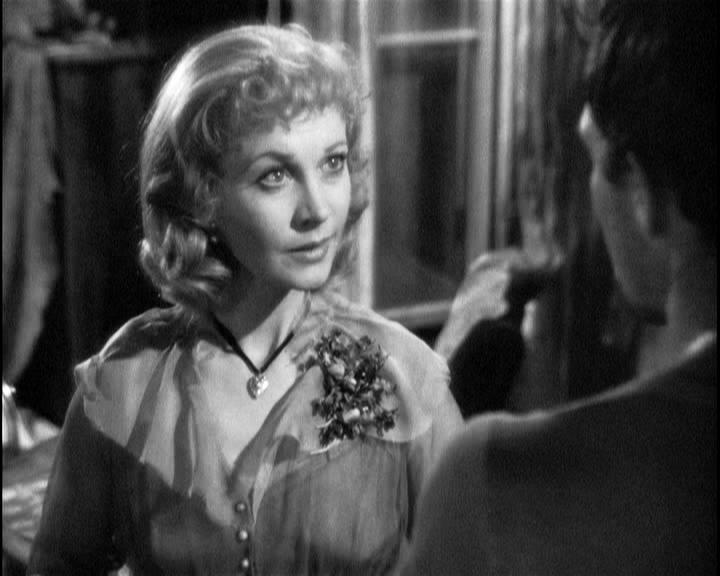 In fact, all 4 principle actors were nominated for Oscars in 1951 with Vivien Leigh, Karl Malden (Mitch) and Kim Hunter (Stella) all winning the prize. It seems incredible that Brando didn’t provide the clean sweep as his performance, for me, is more worthy of recognition than the actual winner that year, Humphrey Bogart in the John Huston film THE AFRICAN QUEEN (which I also love). It should also be noted that Harry Stradling Sr. missed out on the cinematography award which, judging by the images above and the clip you’ll see at the end, seems a bit harsh. An Oscar award, as so often proven in the past, doesn’t mean the picture or actor was better than its competitors, ORDINARY PEOPLE getting the nod over RAGING BULL in 1980 for instance, I mean really. I’ve seen AN AMERICAN IN PARIS, which beat the film in the Best Picture category and, as mentioned earlier, Bogart in THE AFRICAN QUEEN. 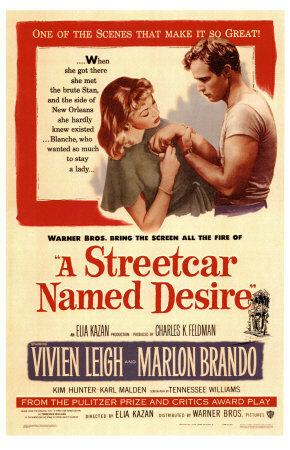 They’re both great but fall way short of STREETCAR for me. 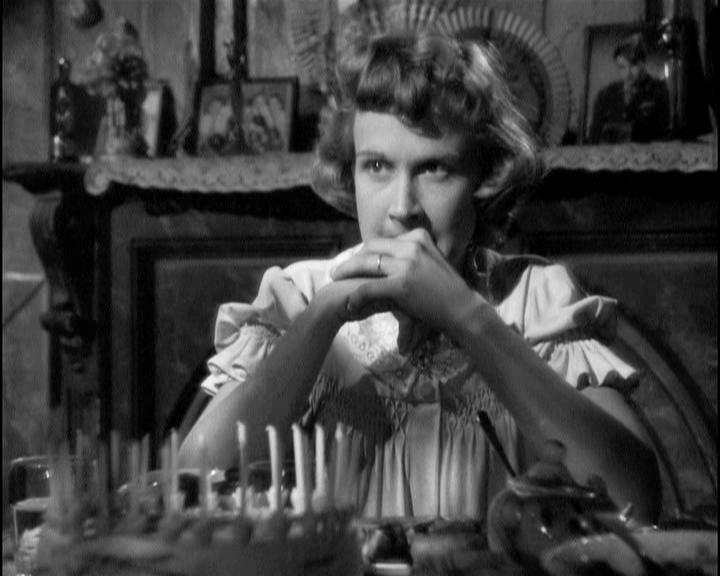 I reserve judgement on A PLACE IN THE SUN for which George Stevens won Best Director…. It’s on my Lovefilm list. The scene I’ve posted is probably the best for showing all 4 principles at work and in explosive form. Note the direction, blocking and pace. 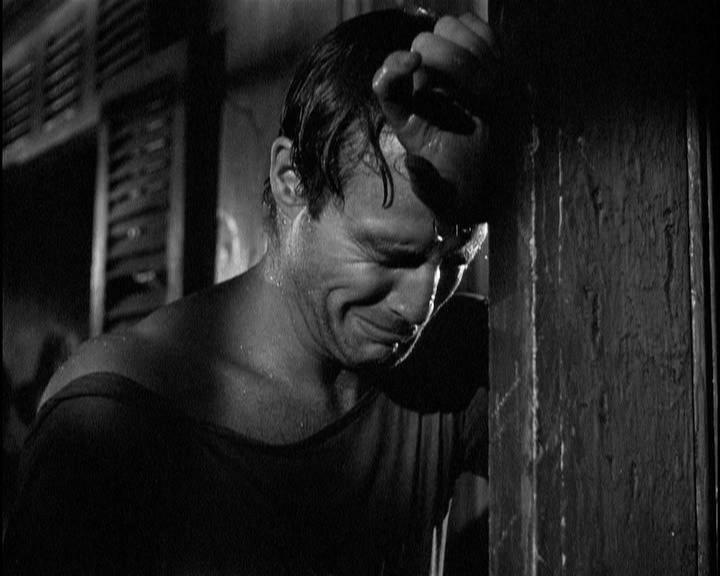 From Brando losing the plot to becoming the helpless little boy that Stella can’t help but love. This despite him giving her a (wonderfully shot off camera) smack for… Well, nothing really. Listen out for the line “Oh look, we’ve made enchantment” at the start which is wonderful. The scene is one of the most kinetic, powerful and passionate in cinema history. Here at Journeys in Cinema I post about the films as I see them, so they’re fresh in my mind from the initial viewing (Except the Great Openings section) in the hope that I spark a desire in the reader to either seek these films out (they’re all available to rent at Lovefilm) or for the person who’s already seen it to revisit the picture. This particular picture I can’t recommend enough, it’s now in my top 3 of all time.